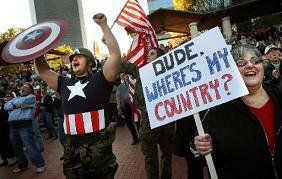 The attitude toward the Tea Party movement is an emerging division in the American electorate. Those who support and those who oppose the Tea Party agenda are often as different as conservatives and progressives. The Tea Party attitude is more predictive of President Barack Obama’s approval than are education, race, religious and party affiliation. In addition, a very large portion of the likely electorate sides with or against Tea Partiers, leaving few moderate voices in between. Tea Partiers are not a fringe phenomenon. The political views of those who identify with Tea Partiers from a distance and those who are actively engaged in the movement are very similar. From the perspective of Tea Party detractors, the sympathizers are for the most part as extreme as are actual Tea Party organizers and participants. And there are plenty of those sympathizers. While people who are official members of Tea Party organizations and those who attend Tea Parties are relatively few, those who are generally sympathetic to their cause are many. In fact, taken together, these three groups comprise 47% of likely voters according to our latest survey. Senator Scott Brown’s assertion that he could not win with a mere support of the Tea Party Movement misses this larger point: Tea Party activists can elect few people but Tea Party supporters can elect many more and winning without at least some of the Tea Party sympathetic vote is, at the present moment, a tall order. President Obama’s approval among Tea Party supporters is very close to zero. In a very real sense, this is the most uniting feature of the movement. Yet, in the wake of the Senate election in Massachusetts, many Democrats seem to believe that they can co-opt the movement’s populist rhetoric, by lashing out at Wall Street and talking about jobs, and in that way harness its intensity while changing its target. The success of this strategy is by no means assured. The populist wave is at odds with Washington on a lot of levels. Only 9% of them voted for Obama to begin with. While they are sometimes perceived as the voice of the independents, this is not entirely true, though they are somewhat less partisan than Tea Party detractors. For example, 32% of Tea Party supporters are independents, compared to 24% of their opponents, and 61% of Tea Party supporters call themselves Republicans while 71% of those who dislike Tea Partiers are Democrats. However, a majority of both Tea Partiers and their detractors are partisan and it is unlikely that the current administration can gain much ground among them. To the contrary, rather than calming them down, the White House’s economic populism might merely shift Tea Partiers’ attention to their other grievances. And a loud airing of these fresh grievances might turn out to be more damaging to the administration and more widely recognized as legitimate. Which of the following best describes your personal view? Which of the following do you think plays the most important role in terrorists’ motivation to attack the US? The data suggests that terrorism can be used to reinforce unity among Tea Partiers while scoring legitimate points with detractors. And it appears that Republicans are increasingly recognizing this and might have already utilized it in the recent Massachusetts election. Politico reported that Brown’s advisers thought the “terrorism issue actually broke more in Brown’s favor than did his opposition to Obama’s health care reform plan.” Though some surveys showed health care to be the most important issue for Massachusetts voters and the public is relatively satisfied with the president’s handling of terrorism, Brown did not shy away from his views that he was against civil trials for accused terrorists and that water-boarding was not torture. Consistent with this, data from recent elections in Massachusetts shows that Brown out-performed Mitt Romney in conservative districts while he underperformed him in more moderate, suburban districts. Though, on average, somewhat more male with a somewhat less formal education than their detractors, Tea Partiers are most distinguished by their attitudes, not their demographics. The anger driving opposition to Washington is primarily directed at the ideas of the intellectual elite, of which health care reform is just one expression. For example, they are much less likely than their opponents (5% vs. 40%) to take the globalist view of their residence as planet Earth – a view, one would guess, shared by a substantive proportion of the cosmopolitan elite. Likewise, popularity of Sarah Palin with the movement is probably more due to mutual animosity between her and assorted intellectuals than to her principled policy positions. Contrary to the often repeated claim that Tea Partiers lack agreed upon set of views, our data shows that terrorism and perceived unwillingness to talk about it in a straightforward manner might be another issue around which opposition to Washington will rally. Ironically, shifting their attention from health care might make Tea Partiers angrier.